X-rays are important in dentistry as they are used by dentists to help them identify problems with the teeth, mouth, gums and jaw. Periapical – show the entire tooth, from the exposed crown to the end of the root and the bones that support the tooth. Bite wing – show the upper and lower back teeth and how the teeth touch each other in a single view. They can also be used to check decay between the teeth and occlusion. Panoramic – shows a view of the teeth, jaws, nasal area, sinuses and the joints of the jaw, and is usually taken when a patient may need orthodontic treatment or implant placement. Occlusal – shows a clear view of the floor of the mouth to show the bite of the upper or lower jaw. How often should my dentist take x-rays? However, this may vary depending on the dental history of a patient, such as whether they have poor oral hygiene and whether they continue to get new cavities. It will also depend on the age and current condition of the patient’s mouth. Therefore, it may be the case that x-rays are required more frequently and your dentist should assess this based on individual circumstances. 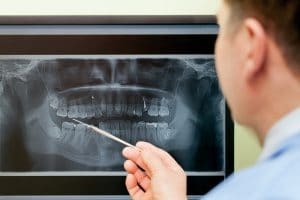 X-rays clearly play an important role in dentistry and we in the Dental Negligence Team, have seen the consequences when a dentist has failed to take any or regular x-rays. We have successfully settled cases, where a dentist has failed to diagnose periodontal disease, decay and many other dental issues. If you have any concerns about your dental treatment, we recommend that you seek the advice of a dental practitioner. If you wish to discuss a potential claim, then please feel free to contact the team.